Encyclopedie's frontispiece. Engraving by Benoît Louis Prévost. 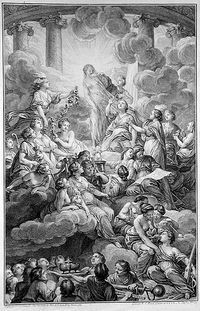 The Age of Enlightenment or European Enlightenment (18th and 19th century) ushered in an age that celebrated reason over faith, not faith over reason, thus no authority but mans reason was considered authoritative. The Age of Enlightenment was the birth of secularism. The man, it was believed so, until then, had been subjected to ignorance and superstition, but now, with the use of reason, he was to attain emancipation and there was nothing he could not hope to perform. Considered the central theme of Western philosophy reason and its relative disciplines are still a predominant system of thought applied within the world today. Especially within intellectual (academia), scientific and social life or culture. The Enlightenment substantially grips European life after the Reformation of Protestantism, which during the 1500s and subsequently effectively wrestled with the intellectual stranglehold of the institutional Catholic Church establishment. Liberal Christianity, liberal Christian theology or just liberal theology are the terms used to articulate and define assumptions of eisegesis that have been historically inherited by celebrating mans reason alone as the sole authority. Embraced during The Age of Enlightenment or what is also called the Age of Reason, during the 18th and 19th century, a time when the superior view of mans reason encroached into everyday life welcomed with broad adoption of its philosophical principles lifting man up to a point which he was ultimate. Inevitably introduced into all realms of life including religious, enlightenment radically changed cultural, social and political milieus that ran counter to the reason of man. Thus governments adopted a secular mindset that pushed further into religious institutions and faith based organizations, attaching separate political institutions with overarching roles that allow co-mingling of values and ideals. ↑ 1.0 1.1 Shelley, Bruce L (1995). Church History in Plain Language (2nd ed.). Dallas, Texas: Word Publishing. p. 312. ISBN 0-8499-3861-9. ↑ Latourette, Kenneth Scott (1997). A History of Christianity:Reformation to the Present. 2. Peabody, MA: Prince Press. p. 1003-1004. ISBN 1-56563-329-6. This page was last modified on 4 July 2013, at 20:21.